When the smoke cleared after a scrappy first quarter of basketball at Carioca Arena 1 on Day 3 of the Rio Olympics, tournament favorites Team USA were in an unexpected dogfight. Their opponents, Venezuela, were playing tough. In just the first 10 minutes, Venezuela’s physical defence had forced 6 turnovers and was keeping the normally potent American offense out rhythm. More importantly, the teams headed to their benches in an 18-18 tie. Over the next three quarters, the all-star talent of Team USA exerted itself and cruised to victory over their South American counterparts. For the Americans, it was their 137th win in Olympic basketball play. For Venezuela’s players and supporters, they had unapologetically challenged the best in the world. Venezuela’s presence in the 2016 Olympic basketball tournament is remarkable. These games mark only the second time Venezuela has qualified to the Olympic basketball tournament and the first time since Barcelona in 1992; 24 years ago. Venezuela is also the only team in the 12-team Olympic tournament field without a single current or former NBA player on their team roster. So how did they get here? The Venezuelans secured their position at the Olympics with a surprising string of victories last year in Mexico City at the 2015 FIBA Americas Championships. It was a tournament that highlighted the Venezuelan‘s willingness to play as a team and an unrelentingly physical style of basketball. Venezuelan national team trainer Germán Andrín García explains how Firstbeat Sports played a critical role in making sure the team was ready to perform their best when it matters most. He also describes how they prepared the team to succeed in the thin atmosphere of Mexico City (2250 m/7400 ft above sea level). “Competing at high altitude creates some very specific challenges for athletes. There are sharp differences in how otherwise normal training loads are experienced by the body in low atmospheric conditions and the adaptation process for each athlete is dynamic and difficult to predict. [Because of the altitude] we brought the team to the competition site 11 days before the start of the tournament. During that time, Firstbeat gave us a lot of information that let us see how players were adapting to playing in thinner, lower oxygen, atmospheric conditions. The availability of this data allowed us to observe and manage the accompanying natural increase in metabolic demands and adapt our training plans on the fly. 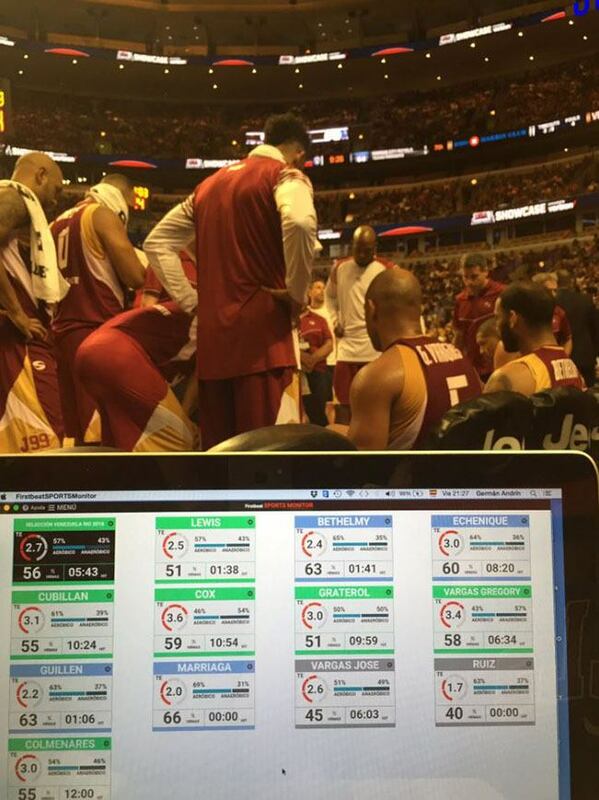 Firstbeat’s Quick Recovery Test also played a significant role during the preparation and competitive phases of the games. In a matter of minutes before training, we were able to get the player recovery and readiness feedback necessary to take a highly individualized approach to our preparatory work. The ability to track performance readiness over time helped identify best recovery practices for each player and gave us insight into complicated situations where similar training loads resulted in different recovery scores for individual players. On September 12th, 2015, 13 days and ten games after the tournament began, Venezuela surprised the world by defeating former Olympic champion Argentina (world rank #3) 76-71 in the finals. The win marked Venezuela’s first ever FIBA Americas Championship and secured qualification for the 2016 Rio Olympics. Germán Andrín García is a top strength and conditioning coach with over 20 years experience across a variety of sports. Throughout his career he has been a strong advocate establishing training parameters based by assessing the specific charges and demands of competitive play at the highest level. He has been working with athlete heart rate data since 2003 and is a strong advocate of Firstbeat’s role as a tool for understanding and improving elite sports performance.